The Cost: $25.00 a month + free US shipping. Save with longer commitments. Here’s the info card for this month’s box. Three of the four items came with a promo code, which is really nice! Potion Handmade offered the same code on this paper. Ingredients for the face mask and the facial cream were also included in this month’s box. This whole experience felt like a science experiment gone wrong, which was most likely user error. I removed my makeup, mixed the 1 teaspoon of mask powder with 1 teaspoon of water in a ceramic dish until “a nice paste formed” per the instructions. Then I went to smooth the paste over my face, and that’s where things went awry. The consistency was akin to modeling clay, so getting it to smooth over—let alone stick to—my face was impossible. It kept balling up and crumbling onto the floor. I mashed it on to wherever it would stay, namely my cheeks and forehead, let it sit for five minutes, then had a difficult time washing it off. Perhaps adding extra water would have solved this. Also worth noting: one tablespoon of product is half of the jar. If I revisit this mask, I’ll definitely use more water, and I’ll be sure to put towels on the floor before I make a terrible mess again. The bottle for this moisturizer is really stiff, and at first, I didn’t understand why. After rinsing the mask off, I went to squeeze out some facial cream, and the bottle didn’t really budge. Eventually, the lotion came sliding out onto the back of my hand, and the scent was heavenly. “Coffee berry” smells a lot like almond extract, or cherry vanilla ice cream. As I spread the moisturizer over my face, I was alarmed with how slick its consistency was. A little goes a long way with this stuff, which explains why the bottle is so stiff: you don’t want to go squeezing a ton of it out because that would be wasteful! I typically use a pretty light priming moisturizer twice a day, so this was quite the contrast. It has a lot of oils, which I could feel right away, and despite all of the skincare reading I’ve done recently, it still made me nervous because it seems counterintuitive to put oils all over your skin to keep it clear. My skin soaked it in within a few minutes, and it left my complexion feeling super soft. And that scent! So good! As long as my skin cooperates and this doesn’t cause any breakouts, I’ll use this moisturizer again during really dry times, which are on the horizon. I’m looking at you, winter. I have a very close and appreciative relationship with dry shampoo, especially after I started regularly bleaching my hair over three years ago. This powder dry shampoo is to be applied with a makeup brush, so it’s already a bit more effort than my usual routine of rolling out of bed, blasting my scalp with an aerosol can, and going on my merry way. It’s unscented and claims to work on all hair colors, which is great to hear because, at any given time, my roots are either icy white, warm blonde, dark purple, or as close to black as you can get as a brunette. After brushing some of this powder over my center part, I was surprised to see how translucent it really is. The oil on my scalp must have soaked it up pretty quickly. I’m interested to see what the longevity is like for this product. At the very least, I’ll continue to use it as a texturizing powder. At the risk of going into TMI territory, I will say that these wipes are made with plant-based ingredients, pH balanced, not tested on animals, and are flushable. They didn’t really stand out to me in comparison to other wipes, but they are a nice thing to have around the house. Also, if you look closely, the front design and the barcode are subtly shaped like someone’s behind. Loved that. Verdict: The items in this month’s Kloverbox were really thoughtfully designed! It’s easy to see that a lot of love, care, and consideration went into each product. As for user-friendliness, it’s a 50-50 split. How much time do I have to spend on applying dry shampoo with a brush? How can I get the mask to stick to my face? Though, the introduction to new brands was appreciated, as was the attention to environmental sustainability. Overall, it was an interesting way to spend an evening, but I wouldn’t say this was my favorite subscription box experience. Can you still get this box if you sign up today? No. Sign up here to ensure you get the upcoming box! 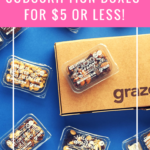 Check out all of our Kloverbox reviews and more beauty boxes in the Women’s Subscription Box List! What do you think of the September 2018 Kloverbox? You can also add in mashed up avocado, banana, yogurt, honey, olive oil etc to powered masks like that! Oh wow, thank you for the tip, SquirrelyGirl! I’m far more likely to have avocado, bananas, honey, and olive oil on hand than some of the other suggested add-ins. I’m not quite there with my beauty routine yet. Will definitely keep that in mind going forward! Those wipes look interesting, I’m always trying to find new ones for my son to use and biodegradable is a huge plus. I use powder masks a lot and sometimes you may have to add a little more liquid to the mix or powder but you can customize them to meet your needs. I like that I’m not throwing extra sheet masks and packaging away too. I like mixing in rose water toner, micellar water and cleansing oil and facial oils with my dry masks. Powder mask have a slight learning curve but once you’re used to using them you don’t have to measure everything unless you want too. The first time I used the Lue mask it was similar to your result here. So good to know there’s a little bit of a learning curve with powder masks. That definitely makes me feel a bit better! With all the helpful comments (yours included! ), I’m already feeling way more confident about giving the Potion Handmade mask another go. Thanks, Anna! The instructions say to use 1tsp powder, 1tsp toner/water, and 2 pumps of a cleansing oil. Replacements for the oil are 1tsp of any of the following: water, unscented witchhazel, or apple cider vinegar. You’re totally right, Aarjullor. I didn’t have have any cleansing oils or the like on hand, so I just went with water, per the directions. I’m not super savvy with masks quite yet, so this was definitely a learning experience for me. Did you use the two pumps of cleansing oil? Sounds like your mixture did not have enough moisture? It was a teaspoon! The tablespoon nod was a li’l typo, so hopefully this clarifies. Thank you for catching it! I’m thinking my second go with the mask will be far more successful than the first, as I’m still pretty green with beauty-related forays. Lots to learn, but I’m here for it!